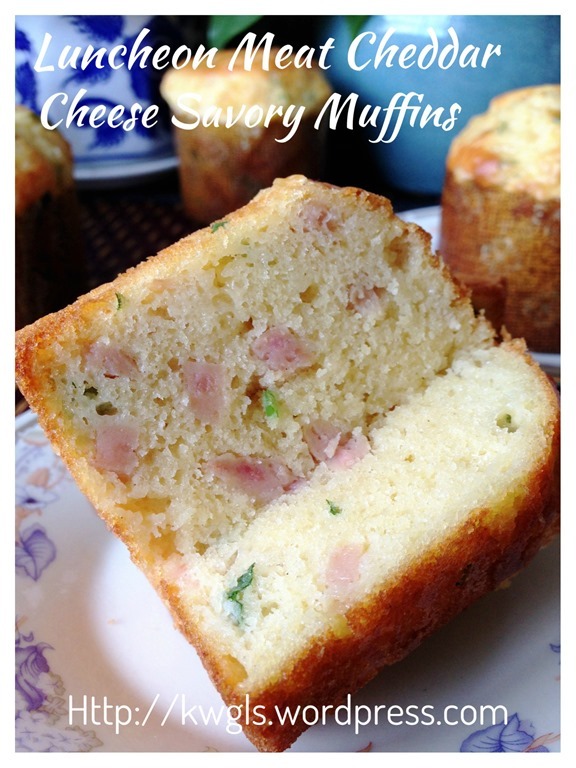 One of the readers have told me that she wished to have some savoury muffins as a twist to the common sweet muffins. 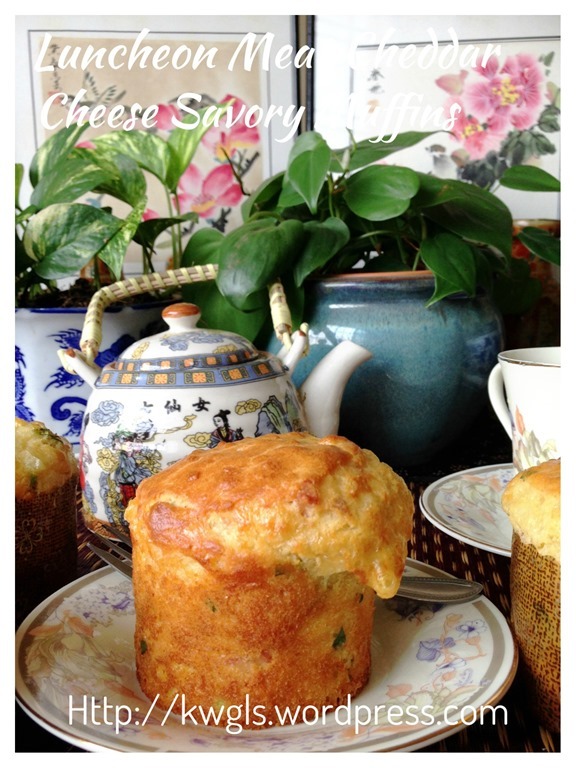 I promised that in this new series of muffins , I will share some recipes for savoury muffins. The first thing that comes into my mind is ham and bacon. On second thought, as these two items are rather pricey and less common compared to luncheon meat in this part of the world, I have decided to use luncheon meat instead. 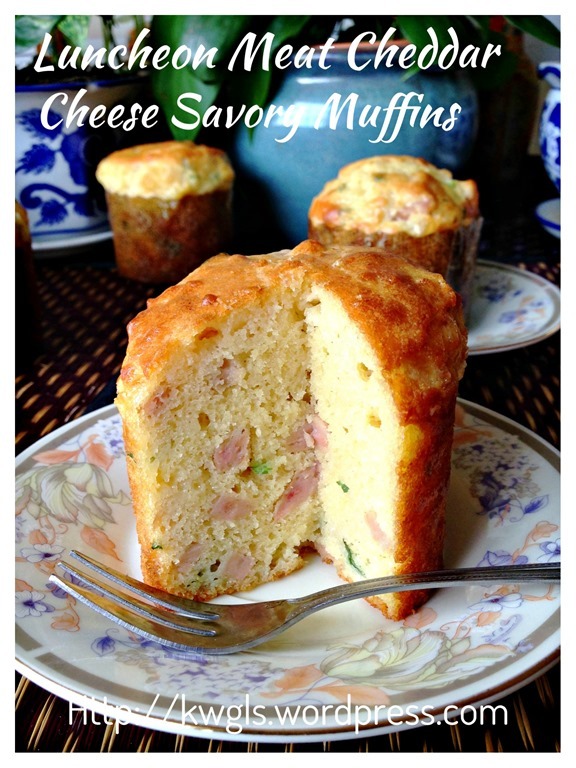 Savoury means that there are great flexibility in selecting the side ingredients and seasonings used. 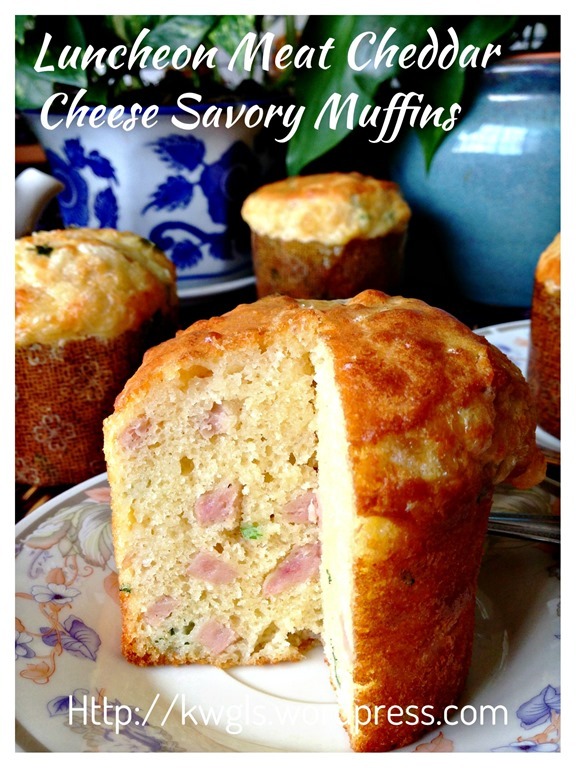 Yes, sugar is usually not added but seasonings such as chicken stock powder (or your preferred seasoning) is used to sweeten the muffins. Readers should have the full discretion in adding seasonings such as salt, pepper or even types of greens (Chinese celeries, corianders leaves , basil or spring onion). Cheese amount is for reference. 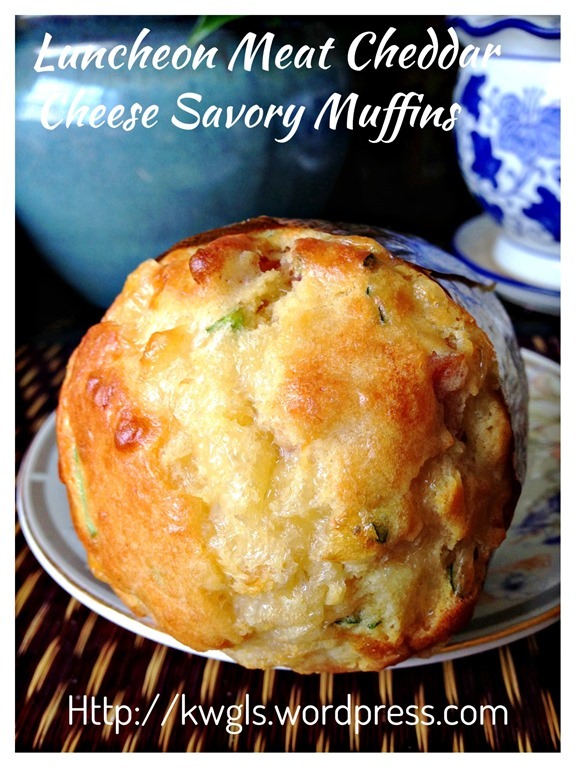 Those who like cheesy muffins can add more but be wary that certain cheeses are very salty and this have to be taken into consideration. 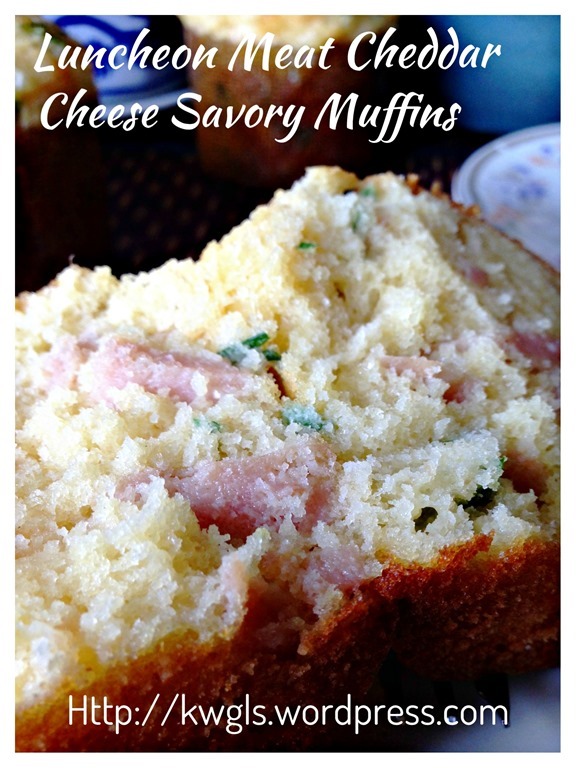 I am happy with this muffin as it is aromatic, fluffy and moist. 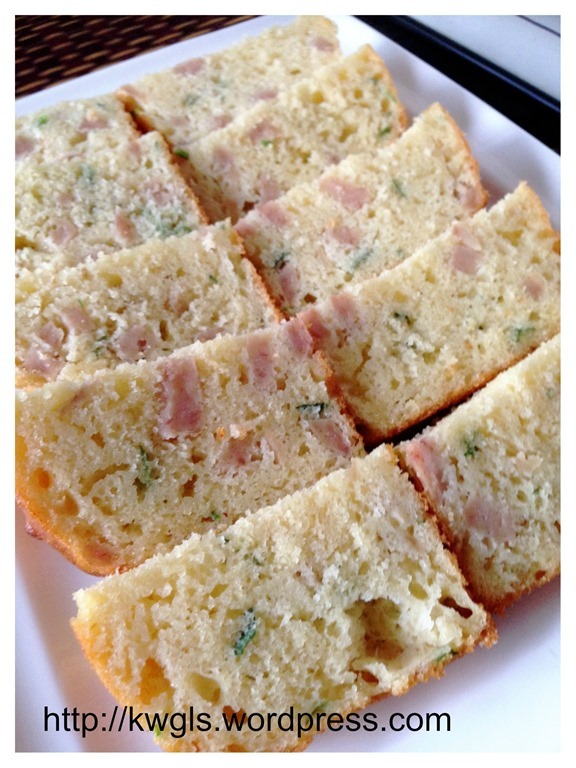 As expected, kids loved it as it taste like buns with luncheon meat but in a cake form. Dissolve the chicken stock in the fresh milk by stirring using a spoon, add this to the egg and cooking oil. Slightly beat it until an emulsion is formed. If chicken stock powder is used, you can sift it together with the self raising flour and by passed this step. 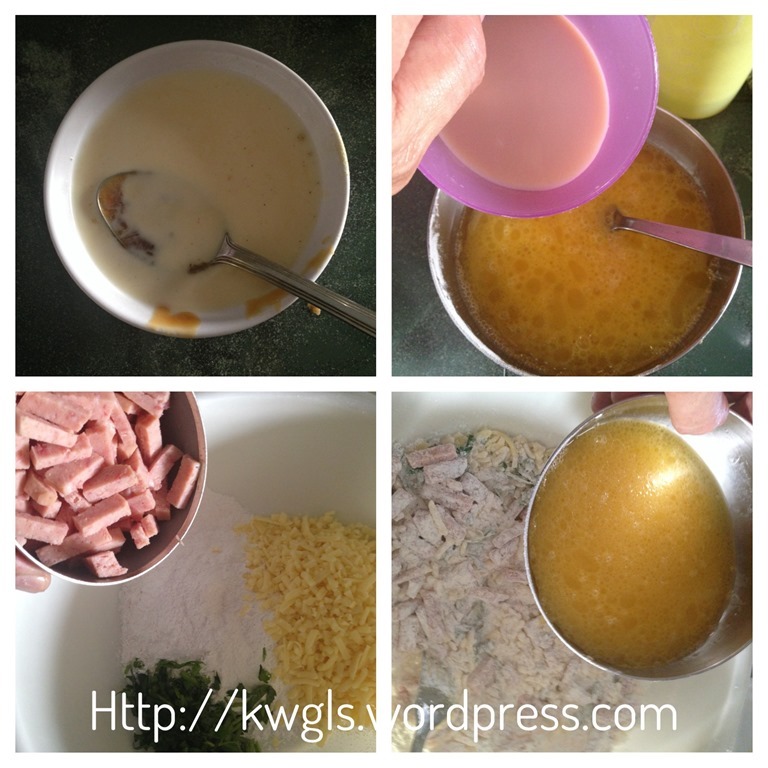 In a big mixing bowl, put the sifted self raising flour, add baking soda, white pepper, luncheon meat, shredded cheeses and chopped herbs. 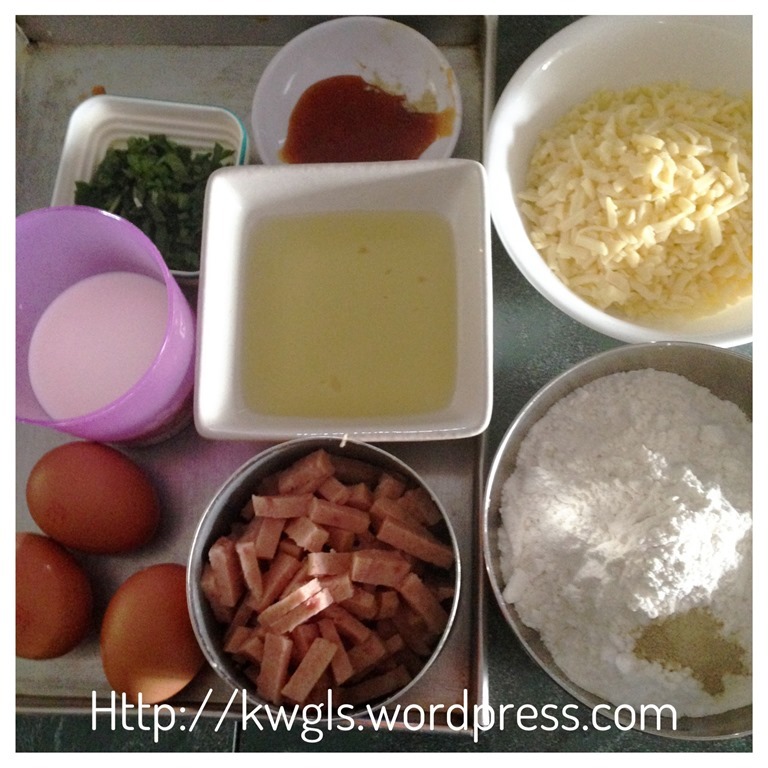 Use a fork to lightly stir it until it is crumbly and the flour coated the other ingredients. Make a well in the centre, add in the liquid ingredients (mixture of milk, egg, chicken stock and oil) above in three times. 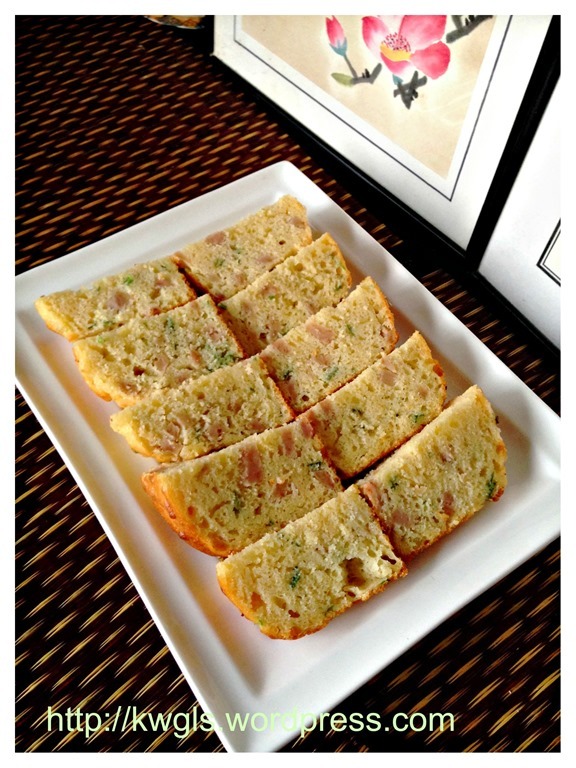 Use a fork or knife to lightly and swiftly stir it until the flour are wet. Slight lumpy batter is acceptable and avoid over mixing. 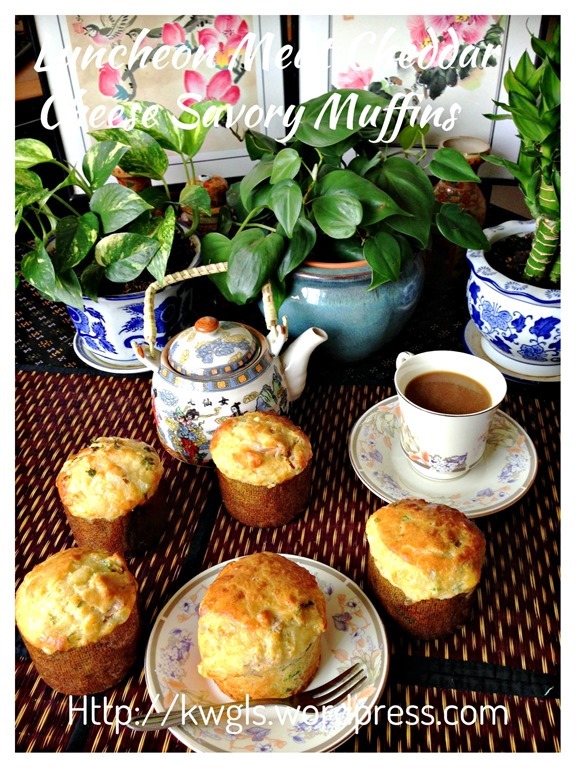 Transfer the muffins to the muffins cup (about 3/4 full) and baked in the preheat oven of 190 degree Celsius for 10 minutes and reduce the oven temperature to 180 degree Celsius and continue baking for another 15-20 minutes or when a skewer inserted comes out clean. Note that baking timing will depend on the volume and height of your cups used. Do keep a close eye at the last 10 minutes of baking or when the fragrant of the muffins starts to penetrate in the house. 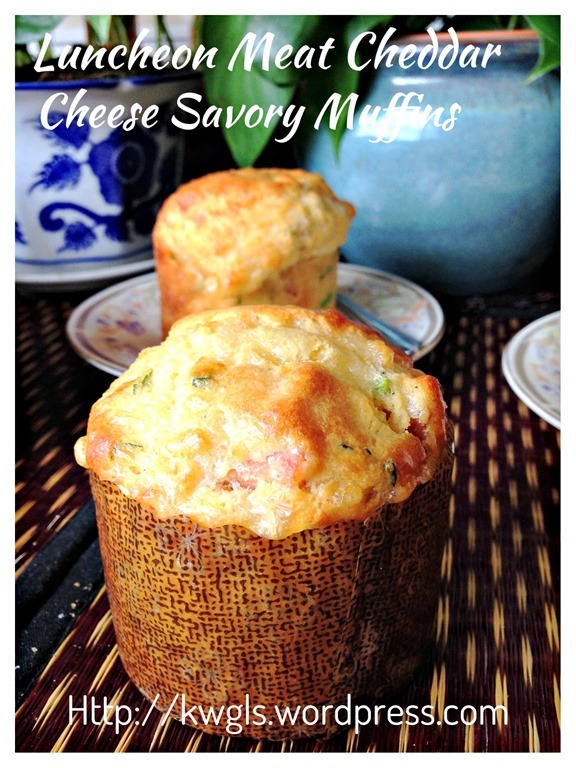 If it browns too fast, turn off the top heat,As this muffins have some cheddar cheeses, it can brown rather fast in parts where the cheeses have exposed. 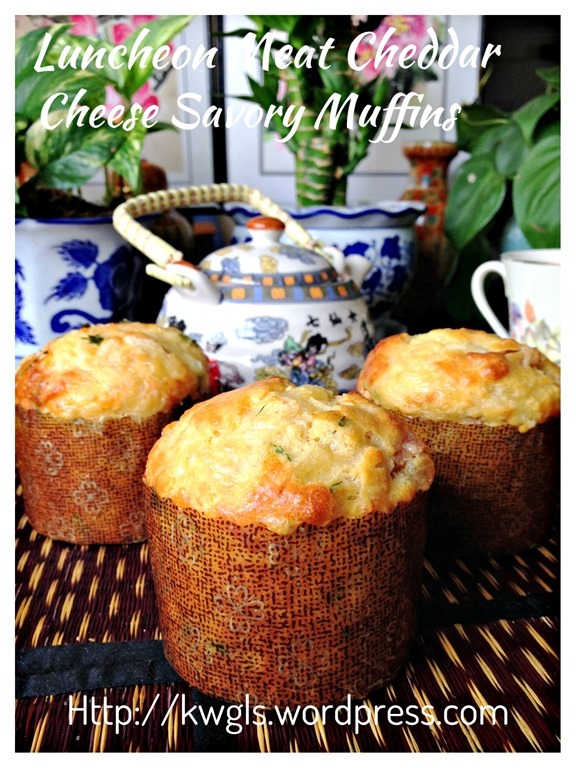 This the sixth recipe in this new muffin series. 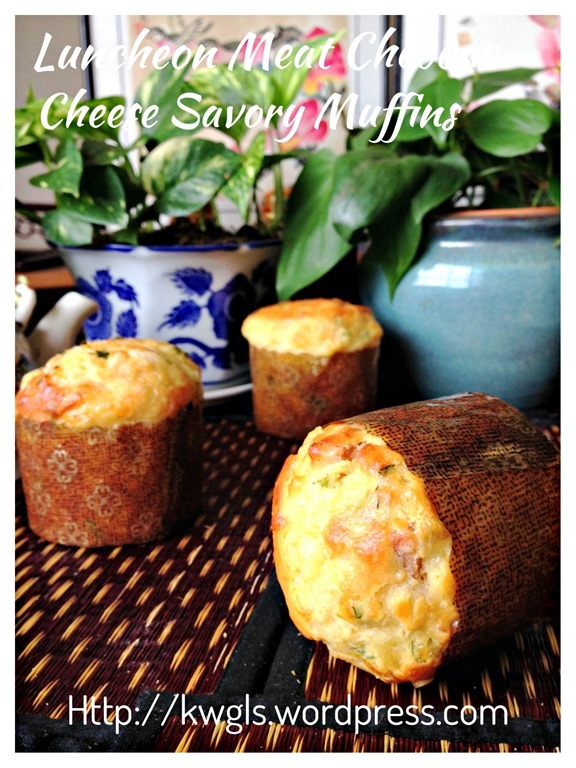 It is a twist of the sweet breakfast muffins. If you like to have a luncheon meat sandwich, I believed you will like it. 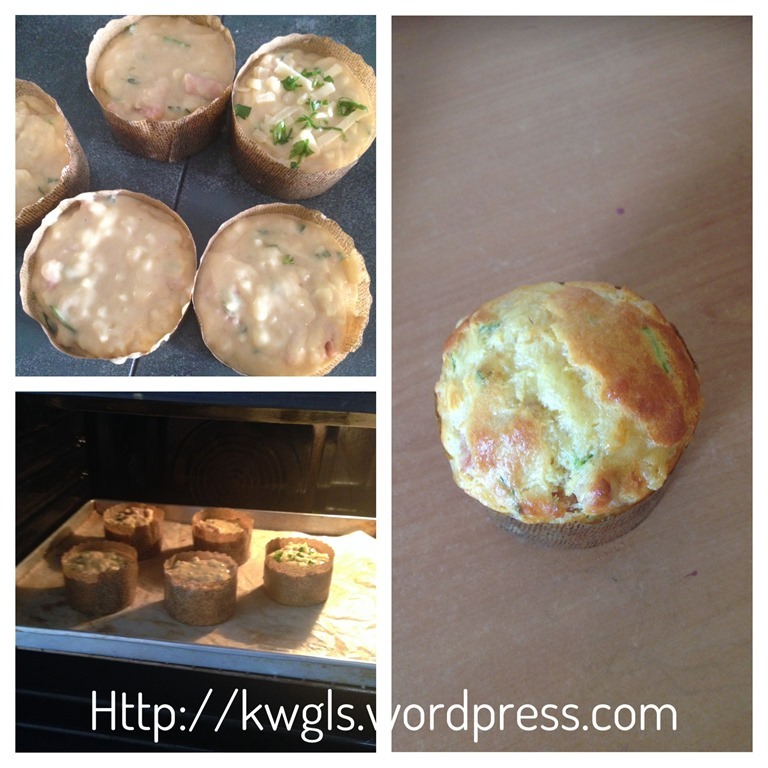 This entry was posted in Cakes and cookies, Food Preparation Series and tagged 8, GUAI SHU SHU, Guaishushu, kenneth goh, Luncheon Meat Cheddar Cheese Muffin, postaday, savoury muffin, 午餐肉芝士小松饼. Bookmark the permalink. Can I substitue the luncheon meat with some cheese or black pepper sausages? I owned a 19 liters electric oven, quite compact in size. So do I use the same oven setting as per your recipe?